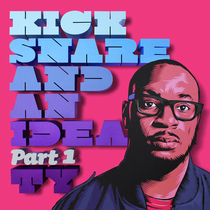 Out April 8, ‘Kick Snare And An Idea Part 1’ is the first of two upcoming singlesunder the ‘Kick Snare And An Idea’ banner, from the Mercury nominated producer and rapper Ty. The lead track on this release, ‘Like You Never’, is a deep and multi-layeredcut that finds Ty setting out his stall and airing his concerns about the state of the music scene today, his philosophical and measured flow carried up on a euphoric melodic hook to a resolute chorus. The video premiere for the track hit over 20,000 YouTube hits in a week. Two more brand cuts showcase Ty’s versatility: the sparse, loping beat and laid-back fluidity of ‘Knock Knock’, and ‘Playing With Fire’ with its staccato delivery over a melodic, dreamy soundscape. The latter track warns of the dangers of ignoring and undervaluing people, especially the young, and features celebrated rapper and poet Akala and grime MC Durrty Goodz, these younger performers each coming with a verse and injecting Ty’s sound with a vibrant, urgent hit of grime. Ty has always been involved in the composition and production of his music, and this has deepened over the course of his four albums (also leading to additional work for Scratch Perverts, Talib Kweli, Blak Twang and Arrested Development). These new Ty tracks, co-produced with long-time collaborator and musical brother Drew Horley at his London studio. In 2001, Ty signed to Big Dada to release his acclaimed debut album, ‘Awkward’. 2003’s ‘Upwards’ then won him a Mercury Prize nomination, and ‘Closer’ followed in 2006, again to many plaudits. Since his fourth LP, ‘Special Kind of Fool’ (2010 via BBE), Ty has featured and collaborated with acts all around the world, including a recent track with former Radio 1 DJ and producer Kissy Sell Out. Also respected as a spoken word artist, in 2012 Ty was asked to perform and host workshops for the British Council, culminating in the end of a 35-year halt on international performers in Port Sudan. He is also a member of The Hip Hop Shakespeare Company - having become involved at the invitation of Akala - running workshops with young people to show the influences of Shakespeare in today’s scene. Recently, Ty founded the Beat Inn, a Facebook group where beatmakers can share their creations. Ty: “It was a case of finding somewhere people could communicate this fanaticism with making music. A lot of people share this love affair, and I tip my hat to anyone who appreciates that process”. Now with over 1600 members, from bedroom producers to international stars, it clearly struck a chord. Catch Ty at the Jazz Café, London on April 10 for the live launch of ‘Kick Snare And An Idea’.